Recognizing its responsibility to strike a balance between native Hawaiian traditional and cultural practices and other stakeholders in the state, a 5-2 majority of the Hawai‘i Board of Land and Natural Resources (the Board) adopted today the recommendation of retired judge Riki May Amano to approve the application for a Conservation District Use Permit (CDUP) to build the Thirty-Meter Telescope (TMT). The Hawai‘i State Board of Land and Natural Resources (BLNR) will hear oral arguments in the Contested Case Hearing for the Conservation District Use Application (CDUA) for the Thirty Meter Telescope at the Mauna Kea Science Reserve, on Wednesday, Sept. 20, 2017 beginning at 9:00 a.m. in the Crown Room of the Grand Naniloa Hotel in Hilo. This is not a public hearing and members of the public will not be allowed to testify, argue, or otherwise present to the BLNR. Minute Order No. 107, posted on Sept. 7, 2017 provides that each party to the contested case will have fifteen (15) minutes to present oral arguments. Up to five minutes of the fifteen minutes may be reserved by parties for responding/rebuttal argument. Those rebuttal arguments will take place after all parties have completed their initial arguments. There are twenty-three (23) parties to the contested case. The DLNR is providing as much seating as possible for public observation, once space has been made for the parties. Seating will be available on a first-come, first-served basis. Na Leo TV will provide live streaming of the oral arguments, but there will not be viewing available at the Grand Naniloa. Doors to the Crown Room will open at 8:30 a.m. for public entrance. There will be no reserving of seats and any seat that’s empty for more than ten minutes may be given to the next person in line waiting outside. Signs, posters, and other displays will not be allowed inside the Crown Room or on the hotel’s property. Food will not be allowed in the Crown Room. 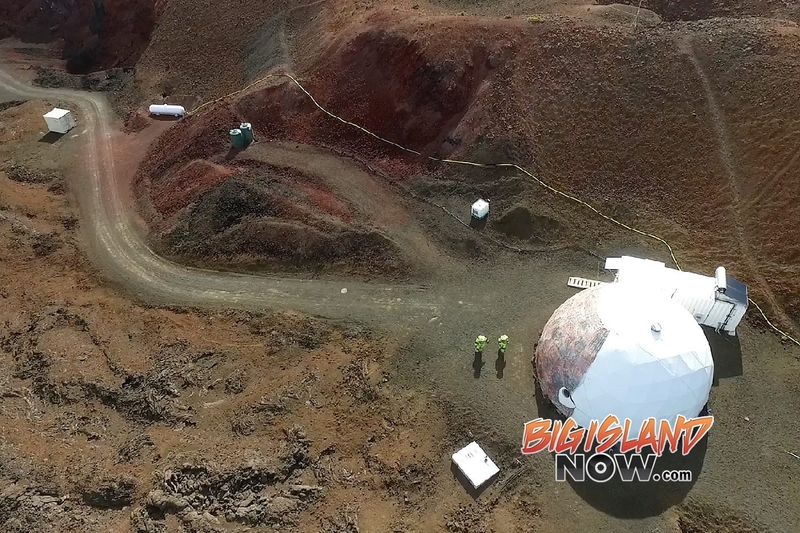 DLNR continues to utilize expanded media coverage rules used during the TMT Contested Case Hearing and only designated pool media; Na Leo (broadcast) and the Hawai‘i Tribune-Herald (print) will be allowed to videotape or photograph the proceedings. All other audio and photographic documentation of oral arguments is not allowed. Nelson also played an important role in the development of adaptive optics technology, which sharpens the images from ground-based telescopes by correcting for the blurring effect of Earth’s atmosphere. As founding director of the Center for Adaptive Optics, a National Science Foundation Science and Technology Center based at UC Santa Cruz, Nelson helped pioneer the use of adaptive optics in astronomy. Nelson presented the concepts that led to segmented-mirror telescopes in a series of papers and technical reports starting in 1977, often working with UC colleagues Terry Mast and Gary Chanan. The largest telescopes at that time had been fashioned by polishing a single glass “blank” to the requisite precision of a small fraction of the wavelength of visible light. In order to maintain that surface, the polished mirrors had to be very thick and were therefore heavy, which was a problem for larger mirrors. Nelson’s idea was to create a single, high-precision optical surface by supporting individual hexagonal mirrors in a close-packed honeycomb configuration. Making this concept a reality required a series of innovative ideas for fabrication, measurement, and control of the mirror segments. In an order (Minute Order No. 43) issued today, contested case hearing officer Judge Riki May Amano (ret.) notified the parties of upcoming filing deadlines in the Contested Case Hearing for the Thirty Meter Telescope (TMT) Conservation District Use Application (CDUA) at the Mauna Kea Science Reserve. During the evidentiary portion of the Contested Case Hearing, spread over five months in late 2016 and early 2017, twenty-five parties to the case presented testimony and evidence. The public is invited to comment on a Draft Environmental Assessment (EA) for Infrastructure Improvements at Maunakea Visitor Information Station (VIS). The University of Hawaiʻi Hilo is proposing a set of infrastructure improvements at Halepōhaku to accommodate and address the increase in the number of visitors to the mountain; ensure the safety of visitors and workers; prevent unintended impacts to natural, historic, and cultural resources on the Halepōhaku and adjacent parcels; and comply with the Board of Land and Natual Resources (BLNR)-approved Maunakea Comprehensive Management Plan (CMP). The Proposed Action includes: a new means of ingress and egress for vehicles to the VIS, a new access lane and parking area, paving of an unimproved path to provide access from the new parking area to the VIS, drainage features, a greenhouse, and relocation of a cabin. Project activities would occur on the university’s leased lands. The access to the ingress/egress and the new parking area would be through access points identified in the Halepōhaku parcel lease. Improving traffic conditions and visitor access to the VIS is important to maintaining a safe experience for visitors and workers. The CMP states that for safety reasons, all parking should be on the same side of the road as existing Halepōhaku facilities. The proposed infrastructure changes improve access and safety for visitors and workers by adding ingress and egress routes that facilitate traffic flow and building a new VIS Parking Area. The purpose of the project is to replace unsafe, ad hoc, road shoulder parking that is resulting in degraded conditions, and provide for safe access to the VIS from the new parking lot. The public comment period runs 30 days from March 8, 2017 to April 7, 2017. 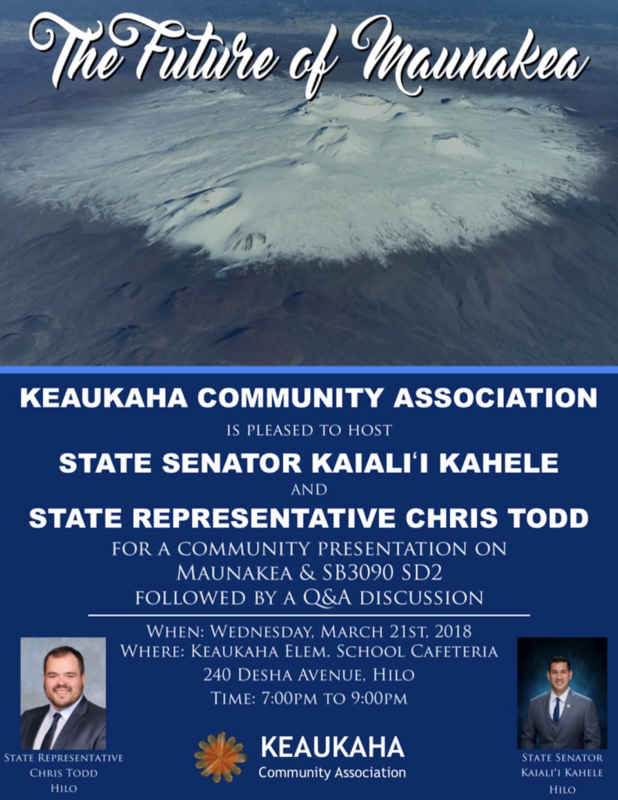 Comments may be submitted via email to: comments@srgii.com or via regular mail to: Attention: Maunakea VIS Infrastructure Improvements Draft EA Comments, Office of Maunakea Management, 640 N. Aʻohoku Place, Hilo, HI 96720. National media coverage of the construction of the Thirty Meter Telescope (“TMT”) has consistently reported that Native Hawaiians are against its construction. We from Perpetuating Unique Educational Opportunities, Inc. (“PUEO”) strongly disagree with these claims. Latest polling on Oahu shows not only a majority of voters support the TMT project, but support from Native Hawaiians has grown into a majority. PUEO is buoyed by the news of poll numbers conducted by Ward Research for the Star Advertiser showing 76% support for TMT with 57% of Native Hawaiians in favor. As we have stated, PUEO hopes to bring a vision of clarity and unity to the process through the perpetuation of unique educational opportunities for our children. We believe that our voice of inclusiveness is getting heard in our communities, and that moving forward with aloha, and integrating culture and science are in the best interests for Hawai`i’s future. PUEO is a Native Hawaiian led non-profit dedicated to enhancing and creating educational opportunities for Hawaii’s youth and their communities. PUEO’s focus on bridging traditional knowledge and scientific opportunities are specific to Hawaii and Hawaiian Culture. In addition to the restoration of the voyaging canoe, Hokualakai, we also provide opportunities for kids to engage in hands-on, inter-disciplinary learning environments. Our intent is based on a unifying vision of Hawaiian language, culture, science, technology and exploration. PUEO seeks to provide and enhance the opportunities for our children to continue the Hawaiian tradition and culture of exploration and learning to all members of our communities. PUEO recognizes the importance of Hawaii’s children to seek knowledge from all sources in order to survive and thrive and to create careers that sustain the survival of their families and needs in Hawaii into the future. PUEO was born to assist our children in this traditional and noble journey. For more information on PUEO, the public is invited to contact us at www.alohapueo.org. The Board of Land and Natural Resources (the “Board”) today issued Minute Order No. 9 (the “Order”) in the Contested Case Hearing for the Conservation District Use Application (“CDUA”) for the Thirty Meter Telescope (“TMT”) at the Mauna Kea Science Reserve. In the Order the Board unanimously denied a motion to disqualify retired Hilo judge Riki May Amano as the hearing officer in the case. The Order provides the Board’s detailed reasons for denying the motion. It also restates some of the Board’s findings in denying a previous disqualification motion. The Board also unanimously declined to grant objections to Board member Chris Yuen’s service on the selection committee that picked Judge Amano. As for the Petitioners’ claim that board member Yuen should recuse himself in this matter and should not have served as a member of the selection committee for the hearing officer, the Board found that a statement made nearly two decades before the TMT CDUA was filed is not evidence of bias or prejudgment. Minute Order No. 9, along with all other orders released by the Board, are available on the DLNR website at the location noted below. The Department of Land and Natural Resources (DLNR) announced today that retired Hawaii island circuit court judge Riki May Amano (Ret.) has been selected as the hearings officer to conduct the Mauna Kea contested case hearing relating to the application for the construction of the Thirty Meter Telescope. DLNR Chairperson Suzanne Case issued a minute order to the contested case parties today announcing Judge Amano’s selection. Judge Amano was selected pursuant to Hawaii Revised Statutes section 103D-304. HRS 103D-104 requires DLNR to assemble and vet a list of applicants. The list is reviewed by a selection committee, which ranks at least three candidates. The DLNR Chairperson then negotiates a contract with the first ranked person. If the DLNR Chairperson is unable to successfully negotiate a contract with the first ranked person, then he or she attempts to negotiate a contract with the next ranked person. In this case, Chairperson Case was able to successfully negotiate a contract with Judge Amano as the first ranked applicant of the selection committee. Judge Amano served as a judge in the district and circuit courts of the Third Judicial Circuit, State of Hawaii from February 1992 until her retirement in April 2003. Judge Amano has been recognized annually as a Best Lawyer in America/Hawaii from 2007 to the present. Judge Amano was born and raised in Hilo; she currently resides in Honolulu. She completed her undergraduate education in 1976 with a BA degree in Political Science and obtained her Juris Doctor degree from the William S. Richardson School of Law, University of Hawaii in 1979. Prior to her appointment to the bench, Judge Amano was a deputy attorney general assigned to the Department of Land and Natural Resources, Transportation and Labor and Industrial Relations; and in private practice from 1981 until 1991. Early Friday morning, July 31, 2015, officers from the DLNR Division of Conservation and Resources Enforcement arrested seven men, camping in the restricted area on Maunakea on Hawaii Island. The Hawaii County Police Department provided transportation support and booking and rangers from the Office of Mauna Kea Management provided logistical support. An additional six men were issued citations and voluntarily left the mountain. After performing remedial work and grading, the Mauna Kea Summit Access Road was reopened at 3 p.m. Monday, July 13 (subject to the emergency rule passed by the Board of Land and Natural Resources restricting access from 10:00 p.m. to 4:00 a.m.). Vehicular access above the Halepōhaku mid-level facilities will be by four-wheel drive vehicles only. Two-wheel drive vehicles will not be allowed past the end of the paved road at Halepōhaku. The Visitor Information Station and its restroom facilities will remain closed. Restrooms are available at the Mauna Kea Recreation Area and Puʻuhuluhulu at the junction of Saddle Road and the Mauna Kea Summit Access Road. Portable toilets for the public are available on the summit.